You might know receptacles more commonly as outlets—the place where you plug in your lamps, computers, toaster ovens, and blow dryers. 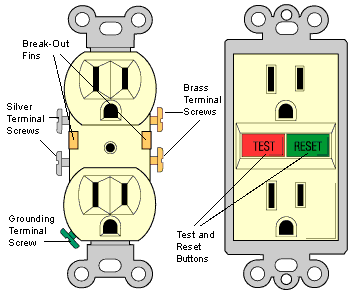 In the United States, most standard home electrical circuits are on a 120-volt line. All conventional duplex receptacles have two places to plug in devices. 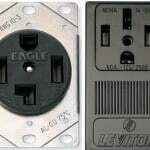 As shown in the illustration, contemporary receptacles include a half-round hole that receives the grounding plug. A contact leads from this hole to a green grounding screw that should be connected to the house ground (metal conduit or a green wire) to provide protection against shock when an appliance is plugged in. 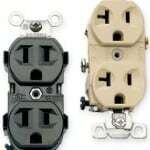 Older houses may not have receptacles with grounding holes, in which case you’ve probably discovered ground adapters, those little plugs that convert the end of a three-pronged plug to two prongs. If you use one of these, be sue to attach the grounding metal flange or green wire to the wall receptacle’s center screw (which must be grounded; otherwise you’ll defeat your electrical system’s safety grounding). 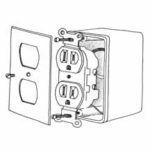 If you have to replace a receptacle, install a grounding box unless the system isn’t grounded with a grounding wire or metal conduit. How do you know if the system has a grounding wire? First turn off the power. Check a receptacle with a circuit tester to make sure it’s off, and remove it from the wall. It should have three different-colored terminal screws: brass screws for black (hot) wires, silver screws for white (neutral) wires, and a green screw for the ground wire. The green terminal screw should be connected either to a bare wire or to a metal electrical box. If it isn’t, consult an electrician to find out whether your system is properly grounded. In the illustration, note the break-out fins at the center of the receptacle. If you remove these (using needle-nose pliers), each half of the receptacle is wired independently. So one half can be wired directly to a circuit—it is always “on”—and the other half can be wired to a switch. Outdoor receptacles are mounted with special covers that seal the weather out (standard types are not safe for outdoor use.) 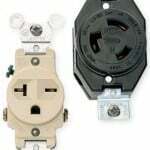 A ground-fault circuit interrupter, also called a GFCI, shuts off a circuit instantly if it senses a hazardous short. Receptacles for 240-volt appliances such as dryers, ranges, and air conditioners that draw a lot of current have different configurations—never force a plug into a receptacle that doesn’t accommodate it. Always replace receptacles with outlets that have the same ampere flow and voltage as amps and voltages vary.